When you gonna learn, bring your own cheese. Bamaholic the guitar wailing at the end of PF's Poles Apart always bring a tear to my eye. Yes, today is a Division Bell day. My fav solo is the the end of "don't Fear the reaper-BOC. for Floyd is " comfortably numb"
You have good musical taste, Holic. My overall fav would be Boston's Hitch A Ride solo at the end. That dude needs some tires. I'd have honked at least twice. My luck would have it being a trannie driving. For shizzle! He/she must not be using that truck for it's intended purpose. And it's got the tow package. Could you imagine??? I like to think I'm pretty eclectic. This rat weirds me out for some reason. More so than it should. 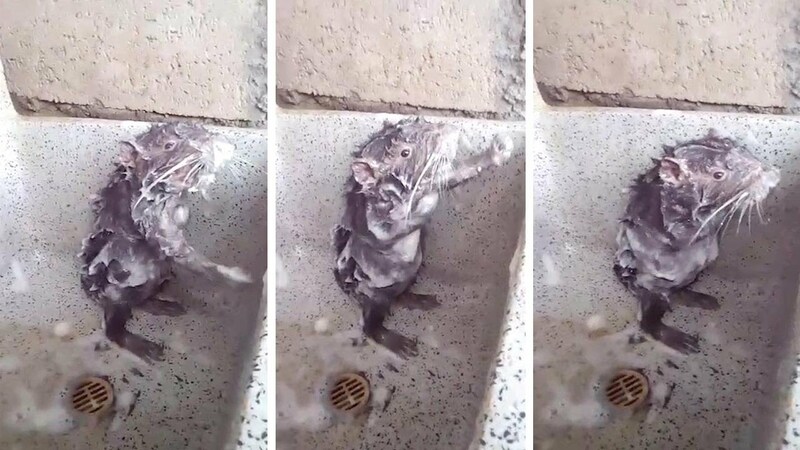 A rat taking a shower doesent really sound as weird as it looks.